If you follow me on Instagram you would have seen this picture and announcement that I'm about to be a first time grandma. My daughter asked me to take their pregnancy announcement pictures. After checking Pinterest for ideas, we discovered so many pregnancy announcement pictures were similar. 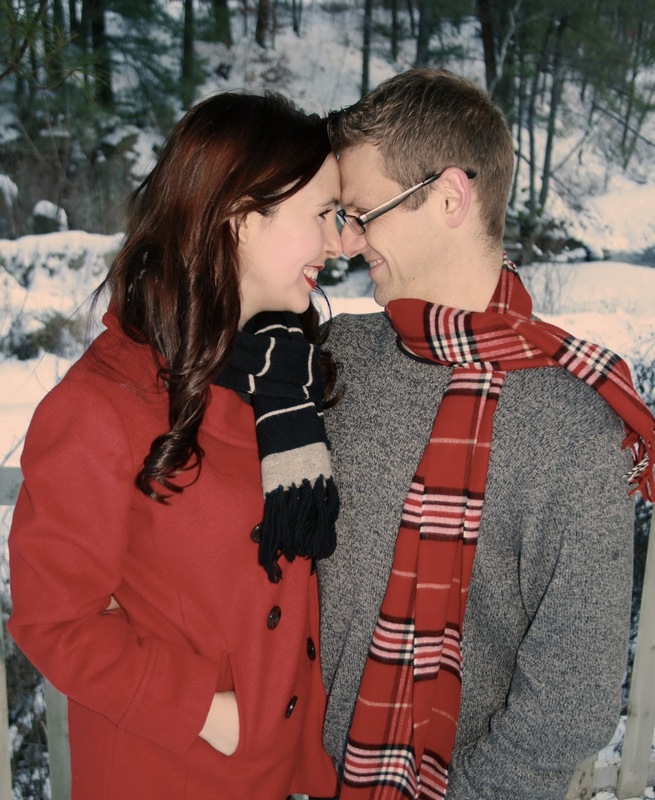 We wanted Ashley and Jason's pictures to have a little bit of originality to them. We saw many photographs on Pinterest where the couple was holding a teddy bear, a onesie, and even a baby snowman. At first we were going to go with the snowman idea since we wanted to take the pictures outside in our beautiful snow-filled yard. But because my house was decorated for Christmas at the time, Ashley spotted this Christmas Rocking Horse amongst the decor. She thought it was a better idea than the snowman because it looked "babyish" and that it would look great with her red pea coat. Then I told her that her grandmother had given her that rocking horse for Christmas when she was a baby. 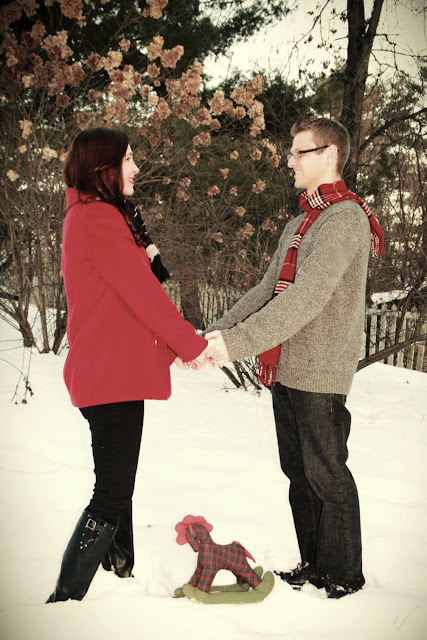 Now we had a personal touch, and it was even more important to use it in the pregnancy announcement photographs. 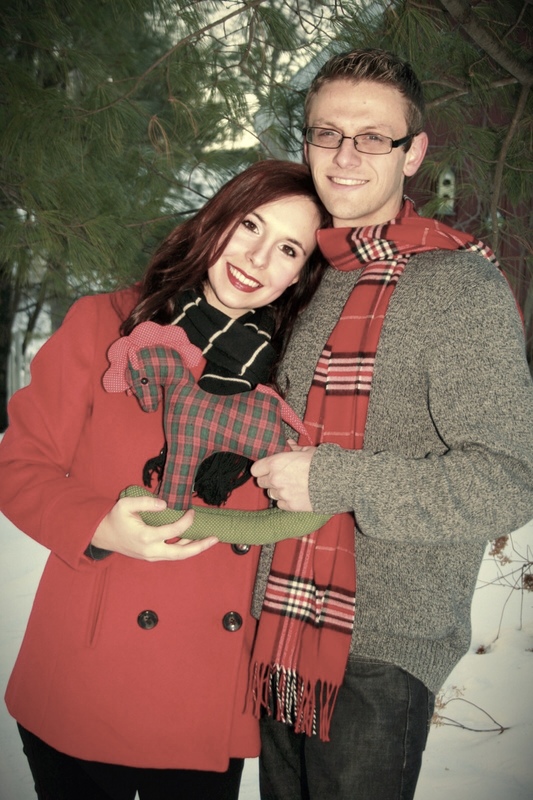 We coordinated their outfits to match the winter scenery, the rocking horse, and each other. We took hundreds of pictures all over the yard and tried many different poses. The few you see on this post were the finalists. We also played with various settings and filters in a photo editing app to get the look we wanted. 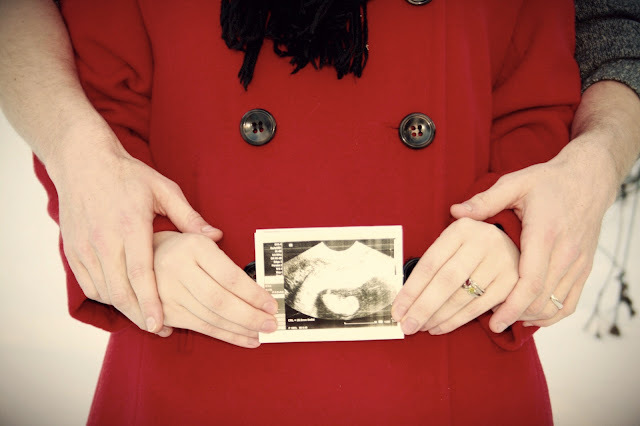 The most common pregnancy announcement photograph you see on Facebook or Pinterest is the one below: the ultrasound photograph. It was really important to Ashley, who strongly believes in the sanctity of human life, to include this photograph on her announcement...so we stuck with this tradition! They do make a cute couple don't they? I'm excited to see what kind of kid they have. They are both handsome, super smart and talented: Ashley is a gifted singer and Jason has a genius level IQ (not kidding) ... beauty, brains, talent....this grand baby has such great genes it might be a super baby! Or, as my husband likes to tease, he/she could end up being a holy terror and Mr. & Mrs. Perfect will have their hands full. We'll see. Whatever happens, we shall be very entertained watching our kids be parents for the first time. When choosing a pregnancy announcement photograph style it was very important for Ashley to have their faces in the picture...and I agree! You would be surprised at how many pregnancy announcement pictures that don't include the faces of the parents-to-be. I think it's important to see what you looked like when you were a young couple expecting your first baby. I also think it's important in the years to come for the child to see how happy mom and dad were to bring them into the world. Pinterest is a great place to go and get ideas for photography. But try not to simply copy other people's ideas. Use it as a bouncing off board to come up with your own creative idea that perfectly fits who you or your subjects are. I use Pinterest all the time whenever I am in a creative slump in all areas of my life, whether it's home decor, fashion, crafts, etc. Sometimes I just copy an idea, but most of the time I see someone else's idea and tweak it to make it my own. Congratulations to all of you!! How exciting!! Such beautiful pictures and using the rocking horse was such a perfect idea! Congratulations to the new parents and to you too, grandma! all the best for this pregnancy, you will enjoy the little one. Thanks Julie, I'm sure we will! What an exciting time! Congrats, lady! Oh my goodness I am so excited for you!! Congratulations!! My mom says being a grandma is even more amazing! The photos turned out perfect! The rocking horse is a very cute idea! Again, a big congrats all of you!!! What an exciting time! Oh how exciting! Thank you! Oh, girl! You are going to love being a grandmother. Nothing better. I am so excited for you. What a lovely couple. Thank you! That's what everyone keeps telling me.